Who are you taking at 11? Mike Brown says we are not allowed to trade back. His reasoning is "because." I dont think 3-4 OLB Allen is solving any of our issues. Weak run D. Weak in coverage. So you're telling me that if a Demarcus Ware, or a Von Miller, or a Kalil Mack is there you keep looking elsewhere because they are a "3-4 olb"? Idk if Allen will be anywere near as good as those three, but he has a chance. Smart teams draft those types of players and make them fit their scheme. 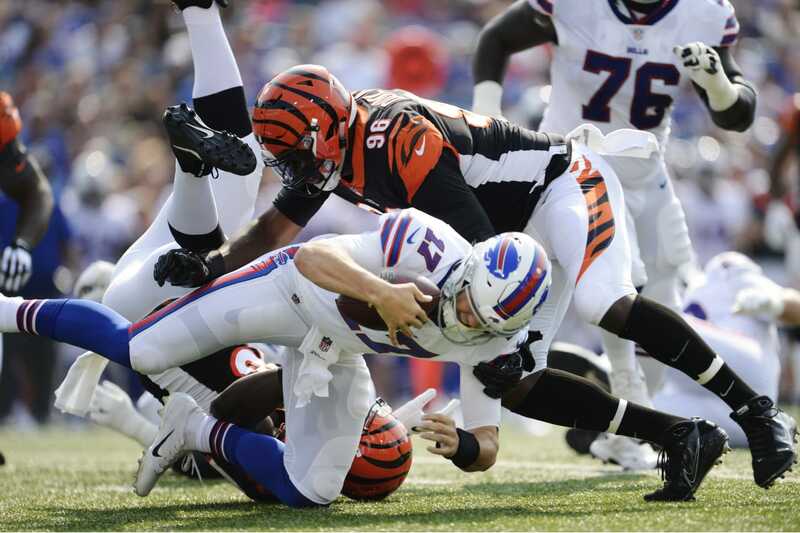 (04-16-2019, 11:04 PM)NATI BENGALS Wrote: I dont think 3-4 OLB Allen is solving any of our issues. Weak run D. Weak in coverage. Josh Allen could play as a stack linebacker if you wanted him to, the reason no one is really considering it is because pass rushers are more valuable than stack linebackers. He would probably be more of a SAM but because of versatility you could deploy him in different packages including some 3-4 looks. As pointed out by others, your other option is Ed Oliver who also offers some position flexibility. (04-16-2019, 10:25 PM)Whatever Wrote: Or Ed Oliver. Getting to pick between 3 of the top 5 Edge/DL in a class that looks like this one seems like Best Case Scenario. I consider DE to be a position of strength. Between Dunlap Hubbard Lawson and Willis we got a solid bunch. Oliver is nearly identical to Geno. Who just got a new contract. Maybe down the road in the future it would be nice having one of them. But i want to win now. Rumor is Lock could be dropping to the bottom of the first. I haven't liked Lock or Grier from the start, I have had the race Haskins,Murray......big drop then Jones. (04-17-2019, 09:51 AM)Au165 Wrote: Rumor is Lock could be dropping to the bottom of the first. I haven't liked Lock or Grier from the start, I have had the race Haskins,Murray......big drop then Jones. I've seen rumors that Haskins will drop to the middle of the first round. QBs are so unpredictable haha. You begin to wonder how much of the rumors are put out by teams that want the player to drop. We'll see what the Bengals end up doing on draft night, but I would love to see a QB in the first round. (04-17-2019, 09:55 AM)Crazyjdawg Wrote: I've seen rumors that Haskins will drop to the middle of the first round. The Lock thing sounds like it is Elway or bust. Hell yes. You run to the podium, thanking the football gods every step of the way. Too bad there is no way in hell he ever falls to us. He might very well be the best player in the entire draft. (04-17-2019, 08:03 AM)Au165 Wrote: Josh Allen could play as a stack linebacker if you wanted him to, the reason no one is really considering it is because pass rushers are more valuable than stack linebackers. He would probably be more of a SAM but because of versatility you could deploy him in different packages including some 3-4 looks. From what I've seen most think he would be fine in a 4-3 as a rush end like Lawson with more versatility and ability to move him around. He's a weapon teams drool over. His arm strength isn't as bad as people like to make it out. His throwing velocity is the same as Drew Lock and Tyree Jackson as well as better than Dwayne Haskins. His accuracy isn't bad either unless your looking at completion percentage which is misleading. I think he is a 2nd round prospect....but that should tell you what I think of Lock and Grier in that he is my 3rd QB over them. This is quite possibly the best case scenario IMO, as it ensures we don't reach for a RT/OG or undersized LB ... I'd happily settle for Allen, Oliver, or Sweat at 11. Or if anyone had the balls to stand up to MB, trade back to 17 and have one of Wilkins, Ferrell, Gary, or Hockenson! (04-17-2019, 11:40 AM)shanebo Wrote: This is quite possibly the best case scenario IMO, as it ensures we don't reach for a RT/OG or undersized LB ... I'd happily settle for Allen, Oliver, or Sweat at 11. Or if anyone had the balls to stand up to MB, trade back to 17 and have one of Wilkins, Ferrell, Gary, or Hockenson! I'd be ok with taking Hockenson at 11 if it came down to it. Wouldn't be my first choice, but wouldn't upset me in the least. Any QB not named Kyler Murray or Dwayne Haskins.